Beatles legend John Lennon is set to have a 40-year-old single malt Scotch whisky named after him in 2020 to commemorate the 40th anniversary of his death. 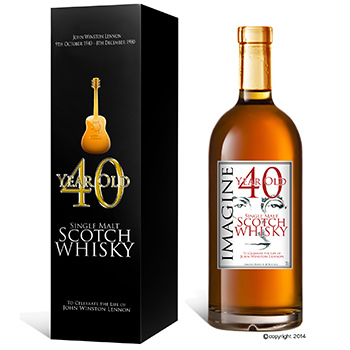 Winston Elizabeth and Windsor collectibles company in Liverpool, UK, will be releasing a limited edition “John Lennon 40 year old whisky” to mark the anniversary on 8 December 2020. “This huge project aims to be the perfect celebration of the life and works of one of the greatest musicians to ever live, and aims to have a global impact fitting of the man,” a spokesman for Winston Elizabeth and Windsor said. “It is fitting that Lennon will be honoured with 40-year-old whisky. “We see the number 40 at the heart of this project for many reasons. Lennon was born in 1940 in the Wavertree area of Liverpool.